Prosecco is a bubbly, sparkling wine named after the Italian white wine grapes used in its production. 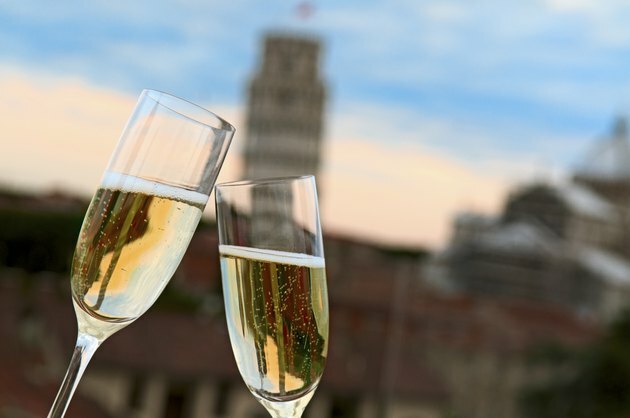 Similar to Champagne but lighter and sweeter, Prosecco has a fruity flavor and aroma that pairs well with salty appetizers or snacks, light pasta dishes, seafood or poultry. Drink Prosecco in moderation, because excess calories from alcohol may contribute to weight gain. The Centers for Disease Control and Prevention advises women to limit themselves to one 5-ounce glass of wine like Prosecco per day and men to have no more than two 5-ounce glasses. A typical 5-ounce serving of Prosecco contains approximately 108 calories, although the exact calorie content may be slightly more or less depending on the particular vintage. For a healthy adult following a 2,000-calorie diet, consuming one glass of Prosecco would supply 5.4 percent of daily caloric needs. Drinking two glasses would be over 10 percent of the calories recommended per day. The calories in a sparkling wine like Prosecco come from alcohol and carbohydrates, in the form of added sugars. Italian Prosecco has less alcohol per serving compared to most other wines, with the average containing less than 12.5 percent alcohol by volume. Each gram of alcohol contributes 7 calories. To determine the amount of alcohol calories in a glass of Prosecco, multiply the alcohol percentage by 7, then multiply the result by the serving size in grams. A 5-ounce serving of Prosecco typically contains about 88 calories from alcohol. The average glass of Prosecco contains about 5 grams of carbohydrates. Because each carbohydrate gram contributes 4 calories, a 5-ounce serving of Prosecco that has a total of 108 calories would receive approximately 20 of those calories from carbohydrates, or 18.5 percent of the drink's total caloric content. As with the alcohol content, the amount of added sugar may vary depending on the winemaker and particular type of Prosecco. Prosecco contains fewer calories per serving than most other types of alcohol. A 5-ounce serving of Champagne can have between 124 to 175 calories, while Cabernet Sauvignon has 175 calories in every 6 ounces. Regular beer has approximately 195 calories per pint, and a mixed drink such as a Long Island iced tea can have around 300 calories. The best way to consume alcohol without putting on weight is to choose low-calorie beverages like Prosecco and drink them in moderation.